Nepal acceded to the Convention against Torture and Other Cruel, Inhuman or Degrading Treatment or Punishment on 14 May 1991. The domestic law addressing the question of torture is limited to the Torture Compensation Act, 1996. This law however fails to meet normative standards to prevent torture. The main objective is to compensate torture victims in a very limited way, not prosecute the perpetrators. Torture is not criminalised in Nepal. Article 26 of the 2007 Interim Constitution of Nepal guarantees the right to be free from torture and mandates that torture should be punishable by law. Nevertheless, no law criminalizing torture has been adopted yet. The right is hard to be realised owing to the failure of the justice system in the country, particularly due to the lack of development of jurisprudence relating to torture by the Supreme Court of Nepal. The legislative framework in Nepal is does not have any additional provisions to prevent torture. It is not mentioned in the existing criminal law in the country. The Torture Compensation Act, 1996 mandates the payment of compensation as a state responsibility and not that of the perpetrator. The legislative framework on compensation is based upon the notion of vicarious liability of the state for an act done by a state agent than that of a crime. Time limits prescribed for filing a complaint also defeat the purpose of the law. Section 5(1) provides a statutory limit of 35 days for filing torture compensation from the date of release from detention or from the date of infliction of torture. In addition, the amount of compensation awarded so far under this law is also negligible. The lack of understanding about the concept of torture by the legislators is visible in the statute since in a prosecution under this law, the defence counsel for the perpetrator is the state prosecutor. There is no witness protection law in Nepal. To make matters worse, it is neither a practice of the courts in the country to ensure any form of protection to the witnesses or to the victims when an accused is released on bail in a criminal case. 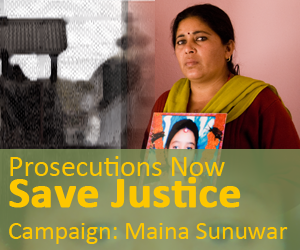 It is common practice in Nepal for the accused in crimes, to intimidate and threaten witnesses and victims. A detailed report about the magnitude of the problem as studied by the Advocacy Forum, a network partner of the AHRC is available here. 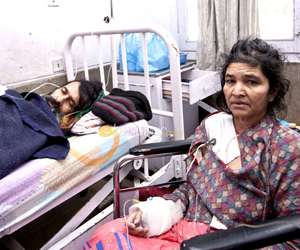 Nanda Prasad Adhikari and Ganga Maya Adhikari are on a hunger strike from their hospital beds at Bir Hospital and have been for over 100 days now. They have been seeking justice for their son, Krishna Prasad Adhikari who was brutally murdered in 2004 during the Maoists insurgency. Their health is rapidly deteriorating. Their only demand before the government is to immediately investigate the case and bring the perpetrators to justice. This is the responsibility of the state. They were compelled to follow such extreme measures as and their efforts have brought no results after the passing of nine years. Ultimately, they decided to go on a hunger strike, putting their lives at risk. These elderly parents want to see justice done for their son, Krishna before they die so that they can believe there is rule of law in this country. The Adhikari couple is a symbol to hundreds and thousands of parents whose children were killed during the insurgency. Justice and Rule of Law are above all, and everyone is entitled to justice. There must be zero tolerance for impunity. The Adhikari couple has become a symbol of the movement against impunity in Nepal. The perpetrators must be held accountable. Moment’s come in the history of a nation when silence becomes a crime. Break your silence and speak out for justice and the Rule of Law. Nanda Prasad Adhikari and Ganga Maya Adhikari should not be left to fight for this cause alone. We are all in this together. Let us express our solidarity for Justice and Rule of Law by showing our support by sending letters to the relevant authorities in Nepal. NEPAL: Corruption in Nepal – Curse or Crime?